Naposledy upravil/-a Fox v 29 Dec 2012, 17:08, upravené celkom 1 krát. 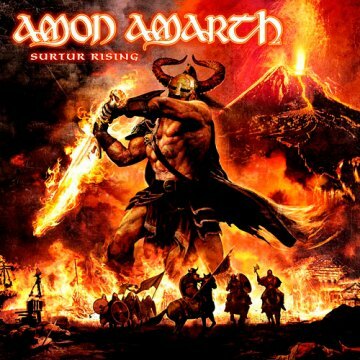 Not many bands can claim their ninth album as the most powerful, dynamic, and downright aggressive of their career, but then Amon Amarth have consistently upped their game with every successive release. Having exploded onto the Swedish melodic death metal scene with 1998's Once Sent From The Golden Hall every album has arrived bursting at the seams with power, melody and immersive storytelling centered around the richness of Norse mythology. Deceiver Of The Gods captures the quintet at the peak of their powers. "Every time we start working on new music we begin with the idea that we're going to write the best album ever," vocalist Johan Hegg states. "We knew we wanted a more aggressive, live feeling to this record but there's no formula behind what we do. We just try to write something that takes us a step further than the last record, and is something that will excite us and our fans. Deceiver Of The Gods is the result. 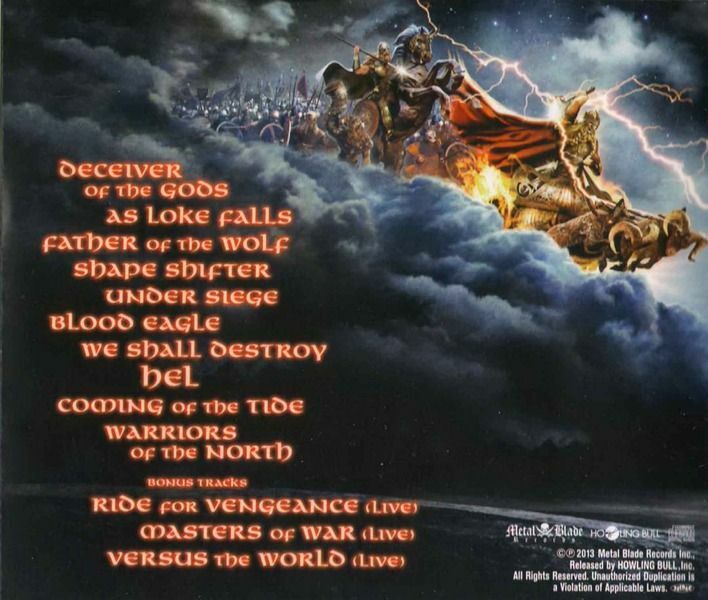 "From the moment the title track explodes in a haze of thrash-flavored aggression to the final mournful passages of epic closer "Warriors Of The North" there is not a wasted moment, the band bombarding the listener with ten tracks of compulsive and electrifying metallic fury. 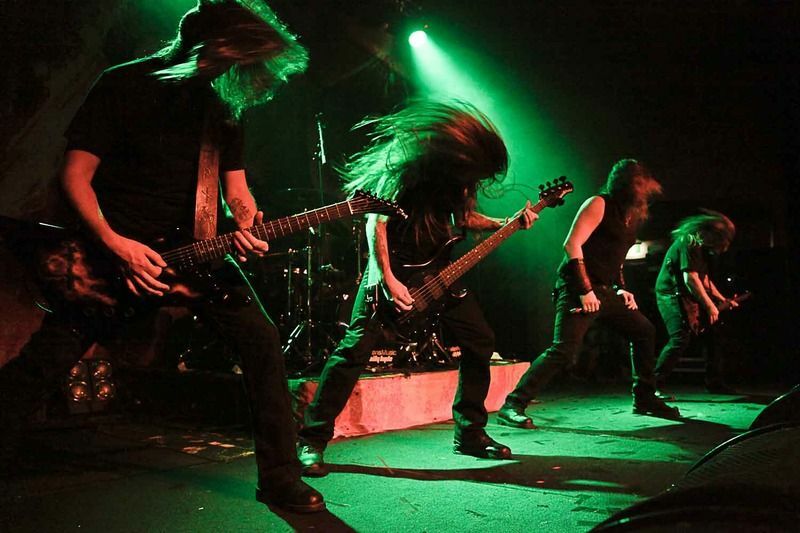 Whether they're attempting to remove your face and separate your vertebrae with the deranged attack of "Blood Eagle" or carrying you on the back of the mammoth grooves driving "We Shall Destroy" and "Father Of The Wolf" they hit with decimating force, all the while unleashing ruthlessly captivating melodies. With the aforementioned thrash elements creeping in, as well as the old school metal and doom accents lending added depth and scale to standout track "Hel", guitarist Olavi Mikkonen admits this time out the band were not afraid to wear their influences on their collective sleeve. "We decided fairly early that we should go all-in on the songwriting for this album. If we had ideas or riffs that were perhaps a little too thrash oriented or traditional-metal sounding for Amon - or that were maybe too Amon or perhaps similar to what we had done in the past - we would still keep them as long as we really liked them. A few years back we would pass on those ideas and riffs, while now we feel it was right to just go with it. I think the result is that the songs are wider, they have stronger melodies, they are better composed with lots of dynamics in them, and there are no fillers or blanks on there. Everything is as good as it can possibly be, and reflects just how driven we were to make this a great record. "When it came to writing lyrics Hegg let the music of the individual songs provide the inspiration, rather than trying to force a set of preconceived ideas upon them. Though the record is not limited to one specific theme, the character of Loke, the Norse God who is commonly thought of as a dark and mischievous entity, has a strong presence, and also inspired the title Deceiver Of The Gods. However, for Hegg the appeal of the character lies with the fact he is not simply drawn in black and white, as others might believe. "I think what's intriguing about him is that he's probably the most human of all the gods in northern mythology. A lot of people see him as an evil character, but he's not the equivalent of Satan. He also does a lot of good things, and particularly with his talent for diplomacy he manages to get the gods out of trouble a lot of times. The only problem is that he's usually the one that gets them into trouble in the first place! I just think he is really engaging in that he possesses a lot of human traits in the sense that we can do good and bad. We can be fantastic people and great people and huge people, and we can be very, very small people. We can be small minded and egocentric and devious and all of those negative things, and I like how he reflects that. "For Deceiver Of The Gods the band turned to legendary producer Andy Sneap, a man whose resumé includes seminal albums from the likes of Cathedral, Arch Enemy, and Cradle Of Filth. Hegg explains, "We wanted more of a live feeling to the recording and we felt that Andy's style of producing could definitely help us with that. At the same time, knowing the records he worked on previously we felt he could probably help develop our sound so it became a little bit more angry and dangerous, without that polished sheen of our recent records. "Mikkonen concurs, and he credits Sneap with playing a pivotal role in just how aggressive the finished product is. "It's rougher, and like a punch in the face, which is what we wanted it to be. Though adding more thrash elements into a few of the songs helps the whole album sound more hostile, it's ultimately the production that makes them sound more aggressive. On the last few records it didn't matter how aggressive the riffs we wrote were, whenever we went into the studio at the end they just didn't sound as intense." In tracking the record at Sneap's UK studio, as much as possible the band recorded long takes rather than clinically piecing things together, determined to give the album as much life as they could. "Fredrik (Andersson) recorded all the drums live, with the guys playing guitars and bass along with him to get the groove of it, and that makes for the energy that you don't get when everyone records separately, and I think that really comes across," Hegg states. "I think that was a very good way to record for us, it gave everyone a better feel of each song, and it was a good time being in the studio and laying it all down. 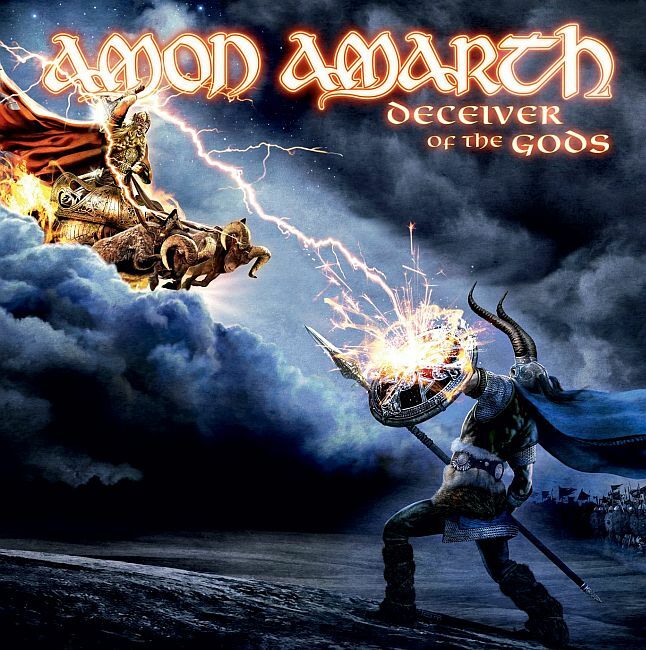 "Having invited members of Entombed, Children of Bodom and Apocalyptica to guest on 2008's Twilight Of The Thunder God andWitchcraft's Simon Solomon to add guitar to two tracks on 2010's Surtur Rising, with Deceiver Of The Gods the band sought out formerCandlemass vocalist Messiah Marcolin to lend his instantly recognizable vocals to 'Hel'. "The idea of doing something with him came up quite a long time ago, and we were waiting for the song that it would best work on," Hegg explains. "When we started getting the basics down for 'Hel', we felt it would be a perfect song for him to contribute to. The way it came together was very natural. We sent him a rough version with my vocals and he worked his own on top of that and around the music. I think our contrasting styles work together brilliantly, and it's really exciting for us to have that on the record. 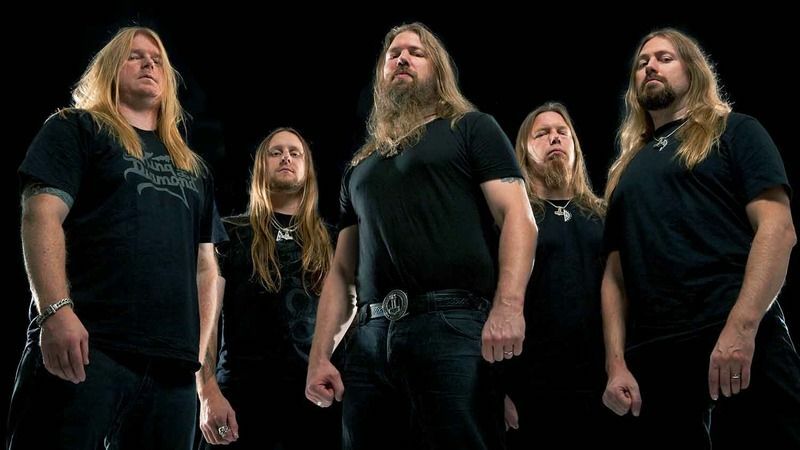 "With 2013 marking Amon Amarth's twenty-first year, as well as the fifteenth anniversary of their debut full-length, their longevity and reputation for releasing killer album after killer album places them on a similar trajectory to the likes of Slayer and Cannibal Corpse, which is rarified company to be in. Likewise, having seen many younger faces flocking to their shows alongside their longtime faithful, the band are enjoying themselves now as much as they ever have, and Hegg wouldn't have it any other way. "It feels fantastic that we've been able to do this for so long and managed to get this far, and it's been a hell of a ride. I don't think we've yet reached the limit of how far the band can go, and we still have plenty of aspirations - and opening for Iron Maiden one day remains high on the list! I'm just happy as long as we can continue doing this. I try not to lose myself in dreams of what might be and rather focus on where we're at and what we're doing right now, and having as much fun along the way as we can." 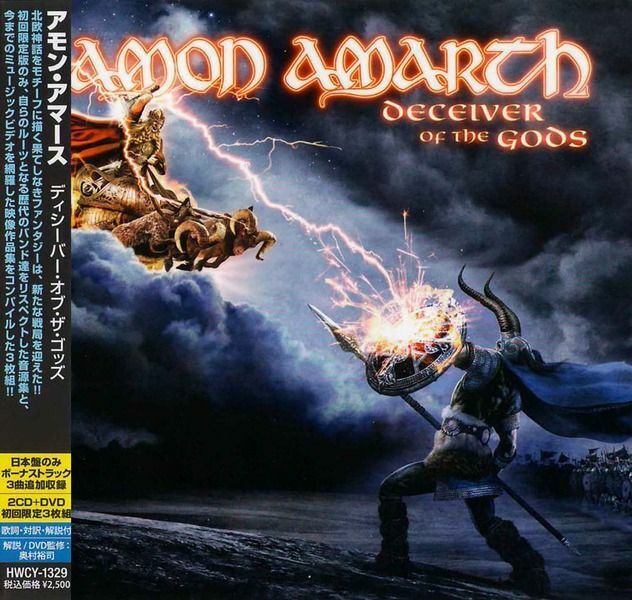 Deceiver of the Gods is the ninth studio album by Swedish melodic death metal band Amon Amarth. It was released in Sweden and Finland June 19 2013, and in USA June 25 2013. Former Candlemass singer Messiah Marcolin makes a guest appearance on the track "Hel".The title of the album and its artwork were revealed on April 12, 2013, and the title song was released on the band's homepage a day later, available for streaming or as a free download. A video for the song was released in September 2014.In Canada, the album debuted at number 9 on the Canadian Albums Chart.This would be the band's last album with longtime drummer Fredrik Andersson before he left the band in March 2015.According to Metacritic, the album received "generally favorable reviews based on 7 critics", with an aggregate score of 67 out of 100.Allmusic praised the album for balancing "unyielding blasts of Viking brutality" with "artful melodies"while Exclaim.ca similarly awarded a favorable score for the band's mixture of "soaring melodies" with the "raw precision" of the rhythms.However, Pitchfork criticized the album as formulaic and uninspired while About.com described the album as a "letdown" due to Amon Amarth's "playing it safe" approach.This view was contrary to that expressed in Decibel Magazine, where the album was praised for duelling guitars invoking Thin Lizzy, Iron Maiden, and Judas Priest while the "expertly woven ebb and flow of tempo and style" caused the album to go "from rampaging to brooding to anthemic over a well-conceived trajectory."